Inventory loans have improved cash flows for many businesses as long as it is part of your collection system. First, If you understand your collection system, inventory financing will work very well. Second, The way you collect payments should be integrated into your financing strategy for acquiring inventory. How long is it taking to get paid? If you obtain inventory financing and it takes you 90 to 120 days to collect money this may not improve your cash flow. When business aging receivables take 20 to 60 days than you may notice a difference in cash flow. Nonetheless, Business collection activity is a historical or past performance and projected performance. Before you take out a loan, evaluate this activity. Lenders may request aging receivables to approve your loan. For instance, if you have more than 50% of your collections over 120 days this means that it’s taking you about 4 months before you see any money after you sell your products or services. In view of, these collections represent a large portion of your revenues than this means that you may only be receiving the majority of your revenues four times in a year. Without a doubt, if you reduce the time frame in collection this will increase the amount of cash flow that you receive. Errors and disputes in your invoices or accounts receivables you need to fix this and diminish this. This will only delay your cash flow in the future. A loan may save you when any projected delays occur that may affect cash flow. Improving errors and disputes and you take out a loan you will increase your cash efficiency rate. Unquestionably, Inventory financing can greatly improve your cash flow if you enforce payment activity. Keep in mind that when you take out a loan you the lender will enforce payment activity from you. You need to do the same with your customers. 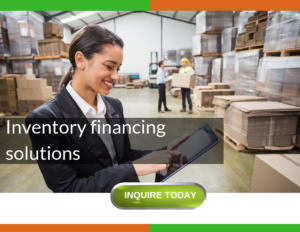 If you’d like to learn about inventory financing at Lendinero, click here.